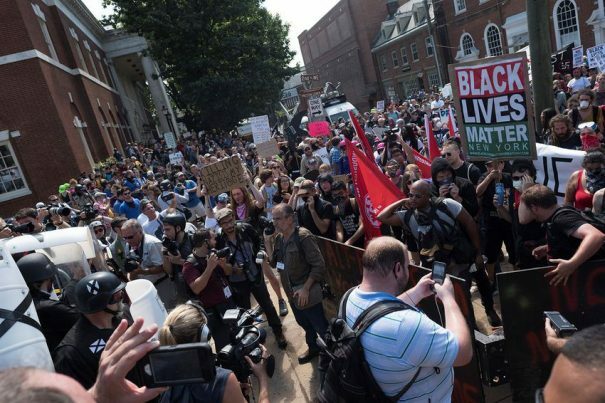 The violent clash that reportedly took place in Charlottesville, Virginia, over the weekend between a group known as “Unite the Right” and an angry mob of counter-protestors has sparked an online witch hunt where individuals who attended the rally are being actively targeted and shamed. All across Twitter, users are posting the photos, names, and even employers of individuals who are said to have attended the rally, with the goal of exposing these people publicly and getting them fired from their jobs. Dubbed as “white nationalists” by the mainstream media, attendees of the Unite the Right rally marched through the campus of the University of Virginia to protest the removal of a Confederate-era statue of General Robert E. Lee. The rally is said to have started peacefully, but quickly got out of control when Black Lives Matter and ANTIFA terrorists began provoking rally attendees and initiating violence. That’s about the time when a vehicle reportedly drove into a crowd, killing one woman and injuring dozens of others. The official narrative being spread almost verbatim by every mainstream media source claims that every person who was in Charlottesville on August 11 to protest the removal of the Lee statue is a “white supremacist,” a “Nazi,” and/or a “fascist.” This has caused many who watched the incident unfold from afar, and through the lens of the spin doctors, to seek vengeance against attendees of Unite the Right. On Twitter, images of Cole White, an alleged resident of left-leaning Berkeley, California, who the MSM says worked at Top Dog restaurant, was among the first to have his picture and personal information published online. Not long after, “White” was reportedly removed from his position at Top Dog, and millions of Americans who hate President Trump are experiencing a moment of bliss – the President, of course, having been dragged into the narrative as an alleged accomplice in provoking the march by his “inflammatory language” throughout the presidential campaign. Another individual identified as Peter Cvjetanovic, allegedly from Reno, Nevada, was also targeted. A professionally-captured photo of him open-mouthed and apparently yelling was somehow used to verify his identity, and he too is being shamed. Cvjetanovic allegedly attends the University of Nevada at Reno. Two more individuals captured in a professional-looking photo with perfect lighting are Ryan Martin and Jacob Dix, both allegedly of Centerville, Ohio. Martin and Dix were seen holding tiki torches like the other attendees of the rally, and thus had their information plastered across the social media-sphere. This seems to be the newest tactic of radical left – to destroy the lives of their political opponents rather than tolerate their free speech. Whether or not the individuals who allegedly attended the rally and the narrative surrounding them are even real to begin with, the fact still remains that the extremist left is stopping at nothing to silence its opposition, which is a frightening proposition for the perpetuity of the American republic.